Tributes to former President George H.W. Bush are pouring in nationwide and in North Texas. At the George W. Bush Library and Museum in Dallas, people from all over the country paid their respects. 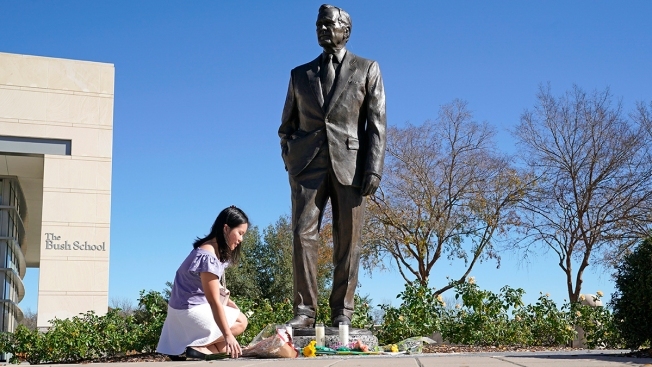 Flowers were left by a fountain out front, flags were at half-staff and visitors left notes of gratitude in guest books set out Saturday morning. "I just said he was a great man. He was a great president and godspeed," said Jim Seibert, a Pennsylvania resident. In memory of the former president, photos that once hung in the White House were on display — images reflecting a father and son's undeniable experience, energy and loyalty. "It's a bond of just love. It's not about politics. It's not about power. It's about just caring for one another," said Jeffrey Rand, a Michigan resident. Five years ago, the then 88-year-old George H.W. Bush was with his late wife, Barbara, for the dedication of the library to their son. "Dad taught me how to be a president. Before that, he showed me how to be a man and 41, it is awesome that you are here today," George W. Bush said in April 2013. A portrait painted by 43 — of 41 — is now on display at the museum. The tributes and guest book to leave condolences will be available through Thursday's funeral.